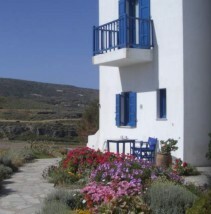 Pollonia is a little fishing village on the north-eastern tip of Milos. It is situated on a channel between the neighbouring island of Kimolos. A small ferry regularly sails from Pollonia to the harbour at Psathi on Kimolos. 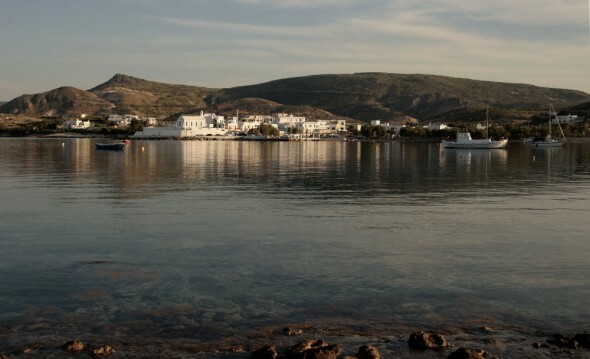 Adamas, which is the main tourist town on Milos, is 15 minutes away by car. The roads are in good condition and driving is safe because there is so little traffic. 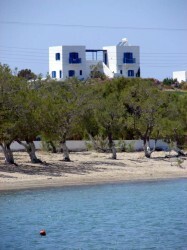 Therefore, it's easy to use Pollonia as a base from which to explore the rest of the island. Pollonia's harbour is fairytale material. Unlike the modernized promenade at Adamas, in Pollonia you can still sit in a café or restaurant right on the water's edge, watching the world go by. However, Pollonia is far from being a one-horse-town. There's a supermarket and a bakery offering everything you need. There is an excellent range of food served at the restaurants, fish tavernas and modern cafés, which blend harmoniously onto the seafront. So evenings are never boring, but you can still have your peace and quiet. Pollonia is ideal for a holiday with children. Pollonia's beach and playground are merely minutes away from the studios on foot.